Browse tar/tgz/tbz, gzip, bzip2, zip, rar, ar (also supporting extfs: lha, zoo, rpm, iso9660, diff, arj, cpio, ...) in any combination (zip files in tar archives, rar archives in CD iso images,...). Access ftp sites without third party tools. Displays e.g. the version and the address of the homepage. This opens the Configuration window. Depending on the function you execute, it can display other information too. 3. Beneath it you see the ListView-Bars. By using the right-mouse-button on them you can configure the respective lister. Only one lister can be the current one. You can control the current lister with the keyboard and the bar will be marked with a different color. It also shows 2 additional information. 4. ‘H' means -- if visible -- that hidden files are not displayed. ‘*' means that display-filters are in use. In the lower part you see the button row. 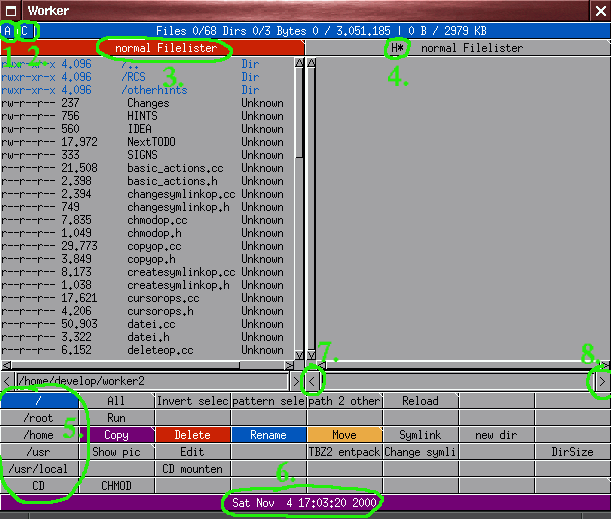 5.The first column contains paths only. By using the right-mouse-button on this bar you can switch to the next bar with additional paths. 6.The last line displays the time. If you are running Worker under GNU/Linux it also displays the remaining memory. To switch the button bar just perform a right-click on this line. Beneath the lists you see two text-input-fields. It contains the path of the current dir. By clicking into one of them you can change the path manually. 7&8. These two buttons let you switch between the buffered directories.